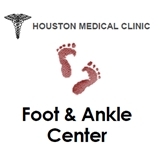 Houston Medical Clinic Foot & Ankle Center (Houston) - Book Appointment Online! Services: Comprehensive foot & ankle medical care, laser treatment for fungal toenails, and reconstructive surgery. More info at houstonmedicalclinic.com. We are dedicated to providing comprehensive foot and ankle medical and surgical care using the latest techniques while preserving the art of compassionate medicine. We provide expert diagnostics and offer a treatment plan that is customized to the patient’s lifestyle. Conservative measures are explored first before surgery. Foot and ankle pain is not normal. Find relief by scheduling an appointment today! Commitment For Your Safety - We use single-use disposable instruments or instruments that have been cleaned, disinfected, and sterilized in a rigorous process to ensure your safety. We go beyond federal and state guidelines in order to deliver the highest degree of care which you expect. A very pleasant experience. Dr. Chen is quiet, competent, caring, and clearly explains the cause(s), treatment procedure(s), and aftercare. I appreciated that he had read my background, and really listened to my comments and questions. The office was clean, and the staff were welcoming and efficient. I felt well taken care of.